Pet friendly rental home in Crested Butte with mountain views. Brand new to the rental market, this In Town/Pet Friendly home is sure to please. With 3 bedrooms, 3 baths, and extra upstairs sleeping area for the kids, it will be the base for your family vacation for years to come. The quality of construction is evident from the moment you step through the door. Unlike a lot of Crested Butte homes the living room, kitchen, dining, and guest bedroom with bath are all on the first floor! No more stairs to climb with groceries or after a hard day hiking or on the slopes! Situated on the East side of town with great landscaping and plenty of parking, this single family home is loaded with features. All new furnishings down to the sheets and towels assure your vacation is nothing short of luxurious. Located by the school, the kids will have the best playground in town right across the street. Entering this home you can't help but feel comfortable. From the warm colors used to decorate to the weathered farm table, everything about this rental says "Welcome Home." The first level is an open floor plan with the gourmet kitchen, living, and dining all compined to create one fantastic space. Cozy up on the comfy couch and watch the big game, deal a deck of cards at the farm table, or whip up a great delicious dinner in the kitchen with new Viking range. The mudroom on this level is large and equipped with a high efficiency washer and dryer should you need to do laundry while on vacation.Off the kitchen, is a guest bedroom with queen bed and full en-suite bath. Head to the second floor and find yourself on a landing with desk area and a reading nook/ sleeping area for kids with a twin over twin trundle bed. Vaulted ceilings on the second level create an amazing sense of space. Step into the guest bedroom on this level, with queen bed and en-suite bathroom, and be surrounded by windows taking in incredible mountain views. Down the hall is the master bedroom with king bed, private deck, and master bath fit for royalty. With dual vanities, massive shower, and oversized soaking tub, you may have a hard time leaving in the morning! Step outside for morning coffee on your private deck off the master bedroom and enjoy unobstructed views of Mt. Crested Butte. Don't forget man's best friend! Dogs are welcome in this home with some restrictions. Just give us a call to get approval for your traveling companion. Outside there is a good sized fenced in yard with patio area, outdoor furniture, and gas grill for enjoying our spectacular Colorado evenings. Wonderful furnishings, perfect location,quality construction, fenced in yard, and pet friendly... the only thing missing at Red Lady is you! The house is very clean and well stocked! Loved the heated floors in master bathroom! Kids played across the street at school playground...snowballs fights!! Truly enjoyed the house. The snow was cleaned out of driveway and walkway for us upon arrival! Thank you. We are from Houston and that would have been overwhelming! 2nd year using your team. We have always had a great experience. I didn't need any services, but I can imagine based on the beauty of the property I would have no trouble reaching if I had been in need of something. I quickly unwound from months of thinking about my son's wedding. And although the wedding took place on Saturday June 23, I woke up Thursday morning feeling very relaxed as I took my coffee out on the front porch. i was glad to have the comfort of the home when I returned from the events of the days and evenings. 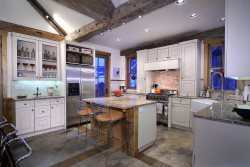 Excellent, well appointed home in Crested Butte. We love Crested Butte, and enjoyed this home is a quick walk to Elk Ave and the free bus stop to Mt Crested Butte and Gothic. We were visiting for a family wedding in Crested Butte. We had family members coming from various places and this was a wonderful spacious home we could gather in and relax. Extremely well supplied down to they little details and it felt very luxurious. We would highly recommend! Great place to stay, well equipped, we were three couples and had plenty of room. Property manager has lots of rules some of which dont pertain to property. This is the second time we have rented through Iron Horse and the process is seamless. They are very helpful in answering logistical questions--airport shuttles, sending skis in advance, etc.. Both properties we stayed at were great. This house was fantastic. Loved the heated floors. The kitchen was very well stocked with everything you could possibly need. Layout was very nice and beds were great. Thanks!! Beyond our expectations! Had more than we couldve asked for! Such a great property and excellent service! Property was perfect exceeded our expectations! Thank you for your convenient email correspondence. Truly, this property is luxury. We've stayed at a large number of VRBO rentals in CB over the years...and this home is by far at the top of the list for the cleanest, & most luxurious. Loved everything about Iron Horse. Very friendly staff that communicated frequently regarding our trip, but didn't overdo it with non-stop emails. House was in excellent condition and the floorplan was perfect for our needs. Home amenities were exactly what we needed. And our dogs loved it too!! !